In truth, I don't really think of Grade 5 as a graduation. (Possibly because I didn't graduate until Grade 8?) But I needed to take a moment to commemorate this milestone. I'm so incredibly proud of Josh as he goes from elementary school to middle school. 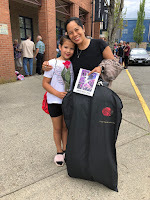 He's gone from a little kid who once said to me in Grade 2 that he hated school, to a big kid who told me that he is both nervous and excited to start middle school. We've definitely had our share of ups and downs so far in his academic journey. But I mostly wanted him to be able to read this when he's a bit older and can process what I'm saying and know that as difficult as it may have seemed at the time, it was all for a good reason. I don't think we would have gotten to this point without going through this journey. From Arnold to Kumar to Danica to Liu to Prunier, we got to see Josh grow and learn the entire way. Not only did we have to navigate the academic challenges, but we had maneuver through social and behavioural challenges as well. Is this seriously elementary school?! This is supposed to be the easiest part! I recall a particularly pivotal meeting I had with Josh's principal in Grade 2. She said to me, "I know that we have done our jobs when you can come and talk to me and NOT cry.". Wow, was she ever right! I didn't know what that looked like back then, but I'm sure glad I do now. Having said that, my most important take away from this journey is this: Brian and I are the only ones who will advocate unfailingly for our kids. It's no one else's responsibility but ours. As Josh goes into middle school, then high school, we take this knowledge with us - the knowledge that we have the power to advocate for him. Our under-resourced school system has measures to help kids who need support. But they aren't always able to be the ones to say "your child needs help". Once we can accept this fact and take the first steps to getting that support, the rest will fall into place. So, I'm going into the next stages of Josh's academic career with cautious optimism - feeling a bit better equipped to deal with what may come, but still aware that the road ahead will have ups and downs. I said earlier that this is a journey. And we want to be sure that Josh knows that we are all taking this journey together. Congratulations on this milestone, Josh. You deserve to celebrate it! 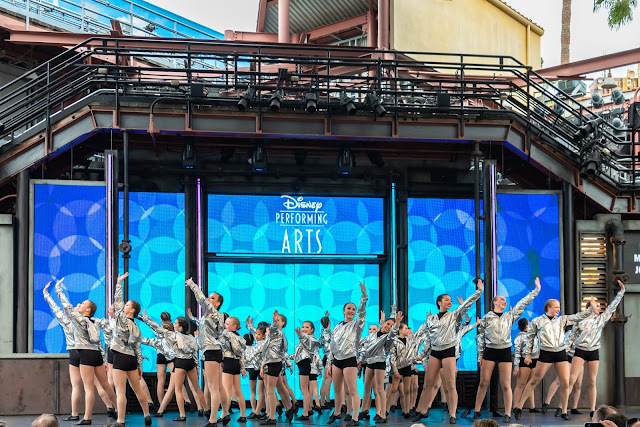 Toward the end of May, we headed to Cali with Aves' dance group so they could perform at Disneyland! When the opportunity came up last summer, Aves said she wanted to do it in a heartbeat. I was excited for her - what an opportunity to dance at Disneyland! It was a tough 8 months working hard to get the production ready. The practices started last October as 2 hours every other week, but by the beginning of this year, they ramped up to 3 hour practices. 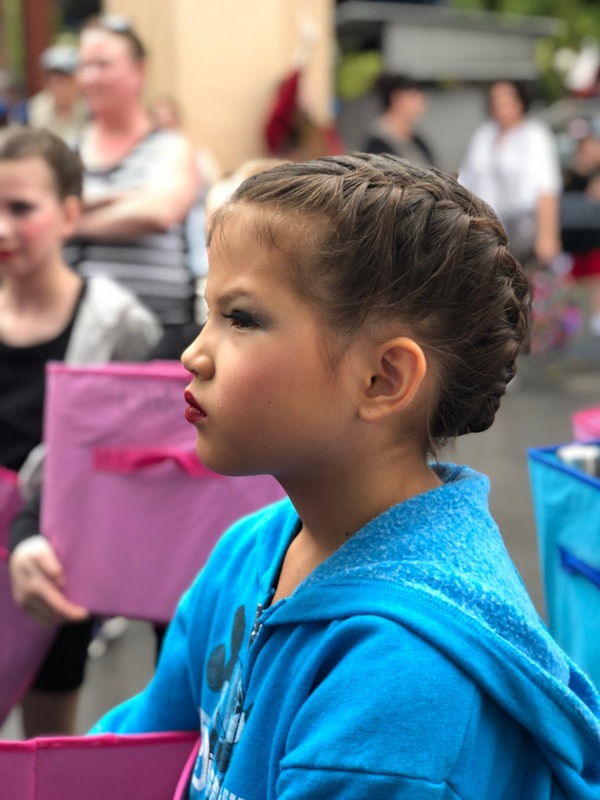 As the date got closer, they added extra practices, dress rehearsals and it all generally took time to get everything ready to go. The girls, the dance coaches and parents all worked hard to make sure we were ready and organized for Disney. Early in the year, I canvassed family and friends to see if anyone wanted to join us at Disney for a May long-weekend vacay. So, in addition to our BDA dance group, our friends PLD decided to come along, too! It was truly a blast going to Universal and Disney with friends. It helped that PLD were pretty laid back and were willing to follow the itinerary put together by the BDA parents group! A: I have a joke. A: What did the sushi say to the bee? Y: (laughing) That’s a good one Aves. Did you make that up? A: (completely serious) No, someone told it to me in my dream. Y: (bwahahaha!) Ave, that means you thought of it, because the stuff in your dream comes from you! A: (still totally serious and a bit exasperated by me!) No, I said someone told it to me in my dream! I learned yesterday that I'm trypophobic. I'm not even going to put a link to the definition because I'm sure there will be images and the images give me heebie jeebies. I went out to dinner with work colleagues last night and we were talking about custard apples. We wanted to get more information, so we googled it. When I looked at the photo of the inside of a custard apple, I said, "OK, I can't look at that. It gives me heebie jeebies." That rang true for one of my co-workers and he said he thought there was name for that! We clarified that what was giving me heebie jeebies was all the little holes in the middle of the fruit. He said there was definitely a name for that. He looked it up and sure enough - trypophobia! Like honeycomb? Yes, that gives me heebie jeebies. Everyone gave examples and yes, they all gave me heebie jeebies (I had goose bumps on my arms to prove it!)! The only example that didn't give me heebie jeebies was the inside of the pomegranate. That was a bit weird. Maybe it's because I think its so delicious, that I overcome the phobia so I can eat it? Anyway, you can google it to see more examples. I'm going to stop talking about it now because the thoughts are giving me heebie jeebies! Hahaha. I always wanted to be a Brownie when I was little. Not sure why my mom didn't put us in. I don't even recall if I ever told her I wanted to be in Brownies! All I know is that I never did it. Fast forward almost 40 years. I asked Aves if she wanted to be in Brownies and she expressed mostly apathetic interest. I needed to live vicariously through her, so I signed her up! She had one stipulation, though. She wouldn't do any overnight camps unless I went too. Ha. I'm told this is the best part of Guiding! I decided that I would sign up as a Girl Guide leader so that I could attend the camps and Aves wouldn't miss out. I thought it would be a fun way to volunteer as well! Not only am I volunteering for sleepovers, but I also help out in the weekly unit meetings. One thing I have learned about myself: I am NOT cut out to be a leader. And I'm definitely not cut out to be a leader of children! I don't have creative ways to deal with the never-ending list of excuses and interruptions that kids can come up with! Most importantly, I don't have the patience. I don't lose my patience with kids, but I find that I'm not alot of 'fun' to learn from. Not engaging. At. All. This past weekend, we went on our first 2-night Brownie camp (by 'we', I mean me and Aves). Aves loved it! She had a blast. Her highlights were roasting wieners and making s'mores at the campfire and singing campfire songs at night. Her most difficult times were sleeping at night (but I think we've figured it out for next time!). At the end of the weekend, I asked her if she wanted to go to District camp this summer and she said yes. I asked her if I didn't go whether she would still want to go and she said yes (as long as we address the sleeping issue)! I'm thrilled! I wanted Aves to be a Brownie to help her develop confidence in her skills and to give her a sense of adventure. It seems to be working! I've registered her for the camp this summer, so fingers crossed that she will go when the time comes! As for me, I'm learning that as much as I wanted to be a Brownie when I was little, I don't really see myself as a Brownie Leader. Camp was mostly fun this weekend. But I had alot of anxiety about the one activity that I had to lead. And then after the activity was done, I worried about how the activity went over with the kids. The kids were great, though! It was interesting to see all the different personalities and how they interacted with each other. And the lifetime Girl Guiders who were the 'main' leaders amazed me! I can learn alot from them in how to navigate groups of children (none of them were actually parents!). Besides the tours, I'd say that the food was another highlight of our trip. Thanks to the great tips from J&C, we ate some pretty good food. I have to say, though, I can eat tropical fruit, coconut and macadamia nuts all day. so the local food agrees with me! We couldn't get enough of local fruit! 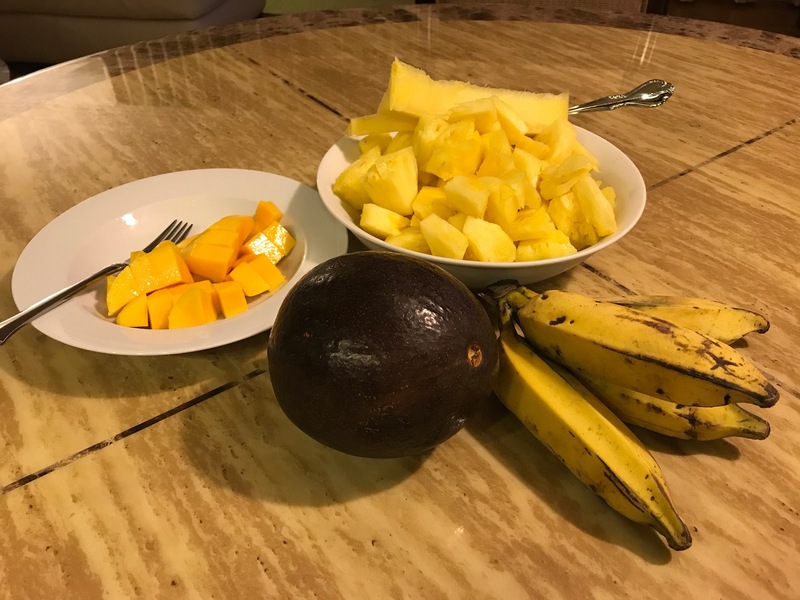 We got pineapples, avocados, mangoes and apple bananas from the farmer's market. So tasty! I'm still surprised (and sad) that I don't like papaya because there are not many fruits I don't like! And the papayas at the market looked SO good. 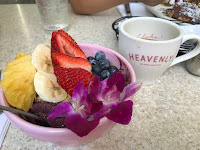 J&C recommended açai bowls and Heavenly, so I had to have the açai bowl at Heavenly! I found my new favourite breakfast. I think I had a Heavenly açai bowl for breakfast every morning after! Even when we came back home, I had to find Hawaiian açai bowls here. Low and behold, I found alohabowls.ca! Now, it's not Heavenly, but it's still worth the trek to find the food truck! Another food highlight was Fumi's shrimp truck on the north shore. We are told it's one of the trucks that serves local shrimp. Truthfully, I'm not sure I can tell the difference between local and non-local shrimp, but local just seems like it will be better all around. The shrimps did not disappoint! We had garlic shrimp, coconut shrimp and shrimp tempura. All of it was delicious. Aside from wanting IHOP, the kids were great about eating whatever we decided to eat that day. Some of their favourites? The gyoza and crèpes at the Japanese food court at Ala Moana (that's the Japanese food court, not the regular one!). And, of course, shave ice. 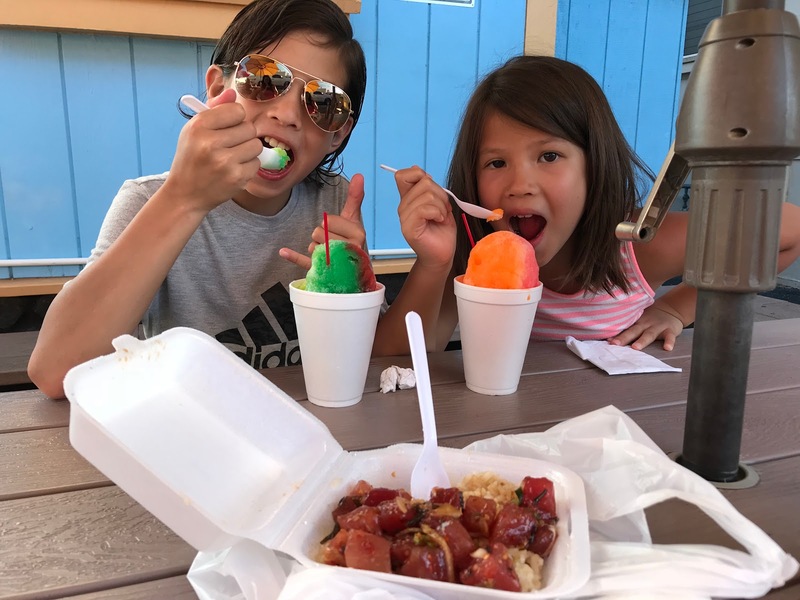 Surprisingly, we tasted the difference between bad shave ice and good shave ice on this trip! One night, we had shave ice at some random stall. The kids didn't even finish them! They said it was meh. I tried some and it was, indeed, meh (who knew?!). I think it was a combination of the quality of the shaved ice and the quality of the syrup. The next day, we made the trek to Waiola Shave Ice (on recommendation) because I couldn't leave Oahu having bad shave ice. Yes, this was definitely good shave ice! And the kids polished them off just to prove it! All this food went hand in hand with hanging out at the beach and pool. I'm not a lay-around-at-the-beach/pool person, but I found myself able to relax with a book while the kids played. I think the way they love the beach makes me enjoy it more. All in all, I think our trip had a good balance of exploring/touring and relaxing. I know I came back feeling like I was on a vacation, so that's a good thing. Tour #2 on Oahu. Since we agreed to go to the Polynesian Cultural Centre for Aves, we had to go snorkelling for Josh. 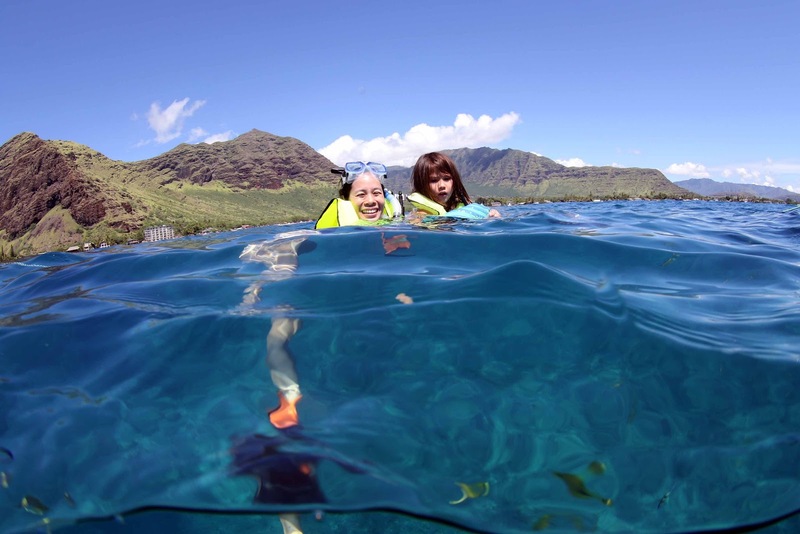 I'm not very adventurous when it comes to snorkelling and Aves flat out refuses. So, we decided to do an afternoon tour that got us out on a boat so that we could get a bit of snorkelling done while Aves had some fun too. 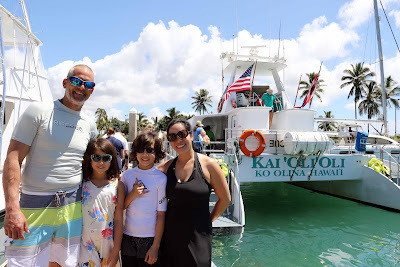 We went dolphin-watching and snorkelling with Ocean Joy Cruises. As much as we planned to go on a jeep tour, we did NOT plan to do a snorkel tour. This was the best last-minute decision on our trip! We decided to book the tour because the weather had been on and off rain. It felt right to be out on the water if it was going to rain (or maybe we might be tempted to stay indoors?). Also, the tour took us to the drier, leeward side of the island. Well, the weather decided to cooperate for our tour. The sky was blue and the weather was perfect! 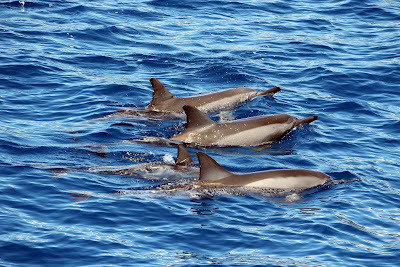 We saw so many spinner dolphins and they 'performed' for us! We swear it was staged! (It wasn't staged.) 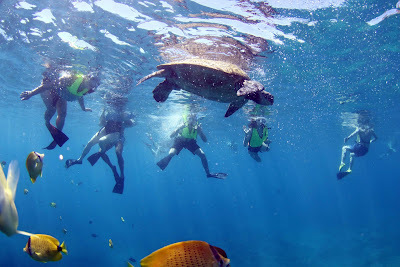 Getting to snorkel with turtles was the icing on the cake. 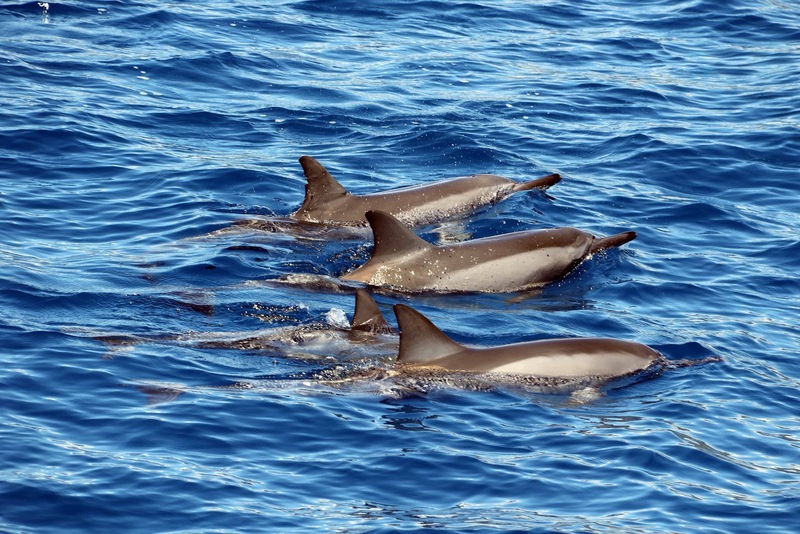 We couldn't believe our luck to get to see so many dolphins and turtles up close. Even Aves, who refused to wear the snorkel gear and initially didn't want to be in the water, got to see a turtle when it surfaced. I have to say that I was very proud of Aves on this tour. She was reluctant to get in the water from the beginning. And Aves can't be convinced. She knows her limits. 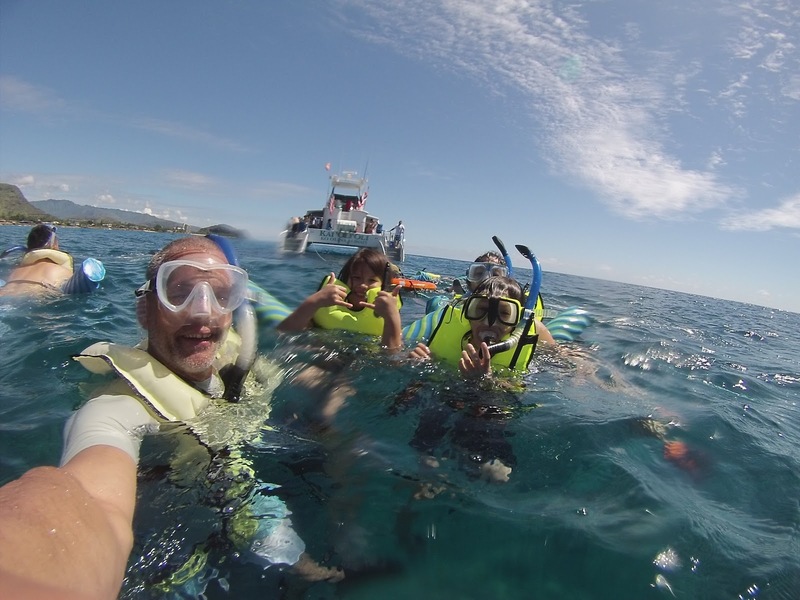 I could tell she was sure she didn't want to use the snorkel and mask, so I didn't push. I could also tell she wanted to go in the water but was scared. I think between the bright yellow floaty thing we had to wear, the flippers and the pool noodles, Aves felt like she could give it a try. She came in with me briefly, we managed to get one picture from the tour's photographer but she was panicky right from the moment she came in and she wanted out. Done. About 10 minutes later, I saw her on the stairs at the back of the boat again. She was ready to come back in the water! This time, she was not panicky at all! She seemed to overcome whatever it was that was freaking her out. She was even ok to let go of the rope that was attached to boat! In the end, she said, "It was alot more fun that I thought it would be!". Ha. Our all-woman crew of 5 were impressively laid-back, fun and skilled. 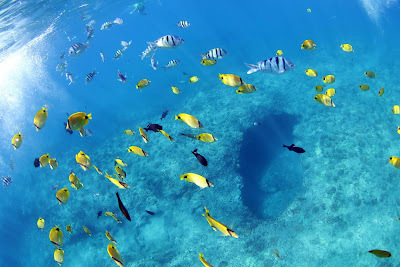 I'm not sure how we were anchored while we snorkelled, but when the boat stopped, one of the crew dove into the water with a rope and when she came back up, she wasn't holding the rope. At the end of the snorkel, she dove in again and came back up with rope. I'm not sure what we were anchored to, but she held her breath a mighty long time! Again, too many photos to post here. You can see the album here - https://photos.app.goo.gl/N4h4QqeqjtPgPY7o1. P.S. Later on when we were headed back to the dock, Aves told us that she was scared because she saw all the fish and though she loved looking at them, she didn't like the idea of them swimming around her. She's not sure how she finally convinced herself that it was ok!